The Black Magic Hybrid Wedges gives the golfer the ultimate confidence in their short game that will improve their scores and reduce their handicaps. If you struggle to get out of bunkers and the rough with any consistency these are the perfect solution because you will get out of bunkers and the rough at the first attempt every time. 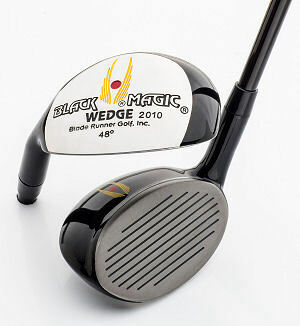 This is because the Black Magic Hybrid Wedges have very little resistance to the heavy rough and of course sand. These clubs make it almost impossible to hit those duff shots that cost the average golfer so many shots around the green and out of bunkers and send their handicaps sky high. The Black Magic Wedges are the only clubs on the market that disprove the old adage that you cannot buy a decent golf shot.